Dr. Dabber has been making waves in the vaping community with their line of concentrate and oil compatible vaporizers. Oils and waxes have proven to be one of the most popular methods of consuming THC in this era of legalized recreational and medical marijuana, so naturally many people have been looking for an easy and effective way of vaporizing these potent materials. 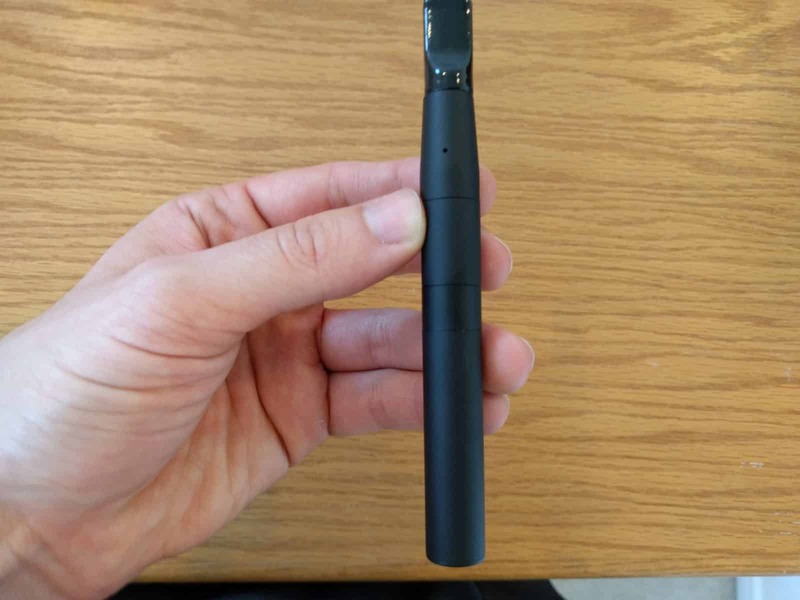 The Aurora is a very minimalistic looking black matte vape pen. The outside of the Aurora doesn’t really feature any flourishes that distinguish it from any of the many other black vape pens in the world. That’s not necessarily a bad thing, however, since the Aurora manges to pull off the whole “minimalist” thing while still feeling like a premium, high-end unit. Even with the low price tag, it feels like something that could cost well over $150. Kudos to the Dr. Dabber design team on this one. The construction of the Aurora is super-convenient: everything is attached magnetically. You heard that right. There is nothing that you’ll need to screw or snap on with the Aurora, everything smoothly attaches via magnets, making disassembly and reassembly as easy as humanly possible. Dr. Dabber claims that they can unlock more flavor while using less heat. The Aurora definitely seems to live up to that ideal. It heats up to less than most vaporizers, but on the flip side you get tons of awesome flavor out this pen. If you’re using a high-quality, flavorful concentrate then you’ll definitely appreciate the flavor-unlocking capabilities of the Aurora. You can toggle the heat settings by pressing the power button three times. The bright, crisp LEDs light up, letting you know which heat setting you have currently selected. The Aurora includes three different atomizers, each designed to increase flavor and give you the choice of how you want to vape: The standard-issue dual ceramic rod atomizer is designed for high viscosity waxes, and should be familiar to anyone who has vaped wax before. The dual quartz rod atomizer replaces the ceramic rods with a more inert quartz. This atty is ideal with lower-viscosity waxes. Last but not least, my favorite atomizer: The ceramic halo. This atomizer eliminates any exposed coils or wires, giving you a longer lasting vape session and really helps to bring out the full flavor of your concentrate. This is a highly affordable premium vape pen that will make a great addition to the collection of any wax-enthusiast. Simple enough to use that even a beginner can get the hang of it, but with enough high-performance specs to make even the most discerning advanced vaper happy. The Aurora has it all. Highly recommended. Buy the Aurora at MintyVapes.com with free shipping.